Note: The term "alternative ladders" is not an established Go term. For another interpretation of "alternative ladders", see double threat ladder maker. Sometimes, it might be possible to atari a group in two different ways, such that both ataris lead to different ladders. The player will have to choose between the alternative ladders. This example is also known as parallel ladders. Here White has a choice of two ladders. Because breaks just one of them, White must be careful. and are the correct way. 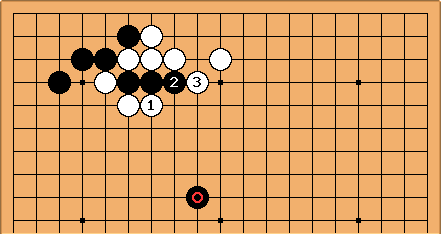 Now Black's stones can't escape. here is a mistake, from the point of view of capturing Black. Later on in the ladder makes it impossible for White to continue. 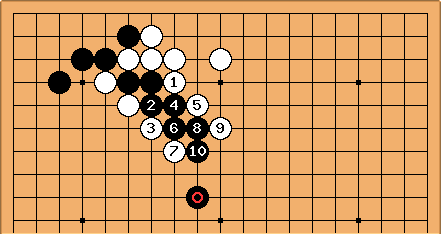 Moving closer along the diagonal does change things, White might then want to play , and here instead: a driving tesuji. 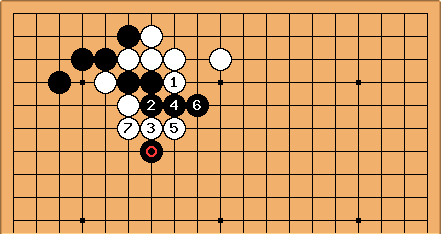 It all depends on the direction of play whether capturing the two Black stones, or blighting on the bottom, is bigger. 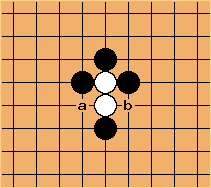 In this example, Black has to choose from two alternate ladders, a or b. These ladders lead to different directions though.